Dr Robert Beulink is one of New Zealand’s leading and highly experienced doctors in the field of cosmetic surgery and appearance medicine. Commencing in 1992, he was one of the very first practitioners in this field in New Zealand, and was instrumental in introducing the new concept of “Appearance Medicine” to New Zealand. 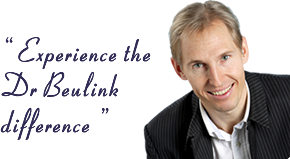 Dr Beulink was born in Dunedin and is a graduate of the Otago University School of Medicine. In 1986 he moved to Christchurch and has resided and practiced medicine in Christchurch since. He has spent time in plastic surgery, burns and microsurgery units in New Zealand and Australia, and has attended and presented at many cosmetic, lipoplasty and leg vein conferences and training workshops throughout the world. Dr Beulink and his wife, Ruth, run the cosmetic clinic, offering a comprehensive range of cosmetic procedures and varicose veins treatments. Ruth is a qualified radiographer with nursing experience, and not only assists with the numerous procedures, but also runs the clinic administration and is a wealth of information for the first time enquiries and existing clients. Having three clinics throughout New Zealand, one in Remuera Auckland, one in Nelson and one situated in a boutique clinical setting in the suburb of Merivale Christchurch, they are a dynamic duo who offer a fully inhouse specialised service, maximizing efficiency with total patient confidentiality, as only a husband and wife team can. ALL CONSULTATIONS, PROCEDURES AND FOLLOW UP APPOINTMENTS ARE PERSONALLY PERFORMED BY DR BEULINK, thus ensuring maximum patient doctor contact, and providing the utmost in patient assurance. Dr Beulink is often at the forefront of the latest and newest techniques available world wide, pioneering and developing these procedures, ensuring New Zealand is always kept up to date with the fast moving world of cosmetic medicine. Dr Beulink’s past dedication, current commitment and ongoing enthusiasm in the ever evolving field of cosmetic medicine and surgery will ensure he will remain at the forefront, bringing with him the highest of procedural standards, personal integrity and continuing patient education and safety. Member of the Australasian College of Phlebology (ACP). 1996 – One of the few first doctors in the world to trial and commence the use of Restylane, a new generation dermal filler by Q Med.